The Mountains-to-Sea Trail is on fire. I didn't know it. 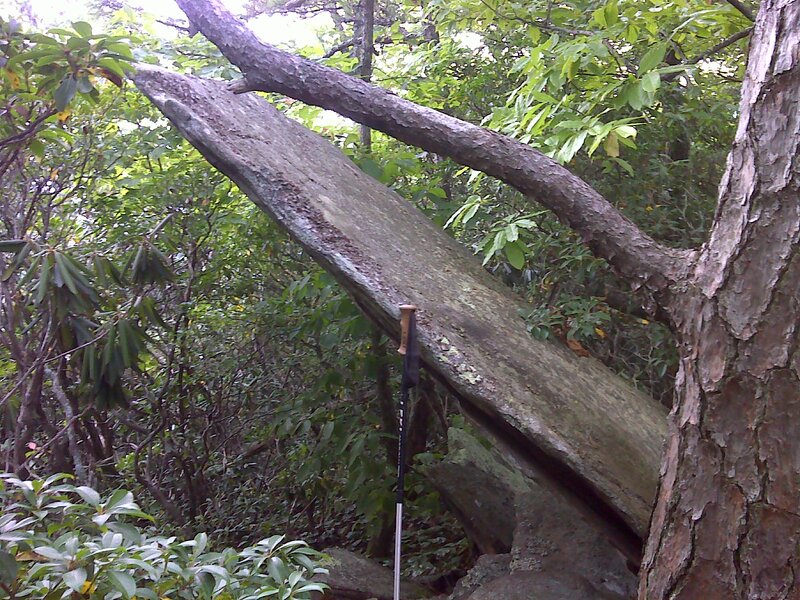 I have been hiking the MST steadily west to east from Waterrock Knob. 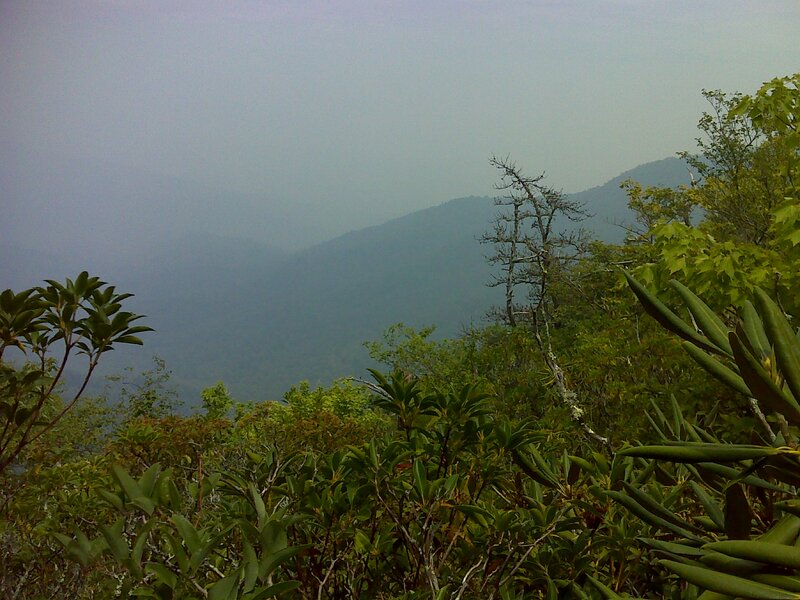 On Mount Mitchell the other day I could plainly see a nasty plume of smoke off to the northeast. It looked farther away than it was. 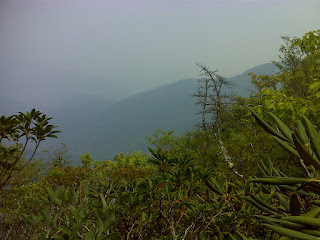 Two days later, hiking on Woods Mountain, I was immersed in that smoke. It was so thick that the visibility was down to a mile and breathing was a bit uncomfortable. Still, I didn't know for sure whether the trail was closed ahead. 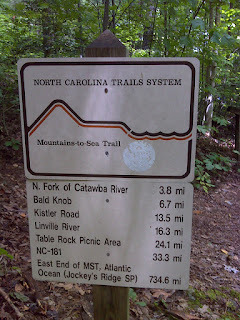 I had not been checking in on the Friends of the Mountains-to-Sea Trail's web site, or I would have known. Then I emerged at the Woodlawn Work Center and saw the sign. End of my road. 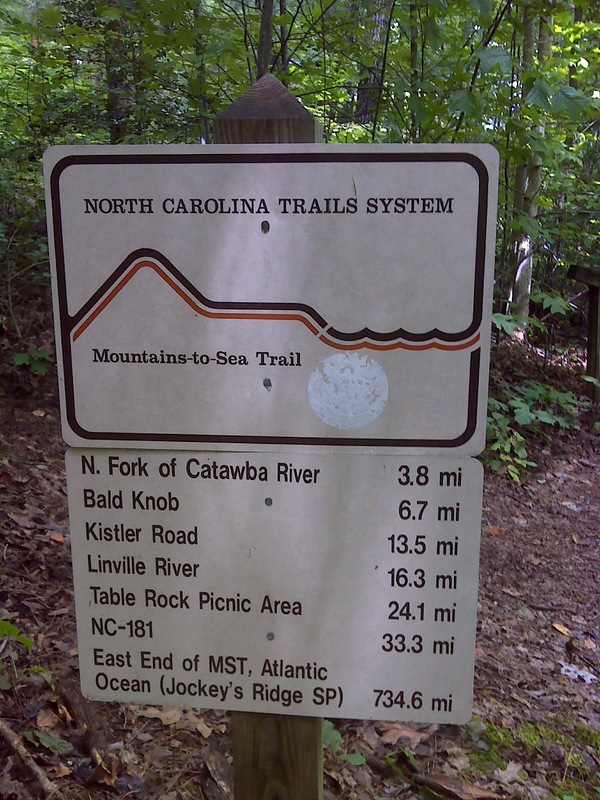 I could hike a few more miles to the Catawba River Bridge but then would have to bypass a big chunk of trail. 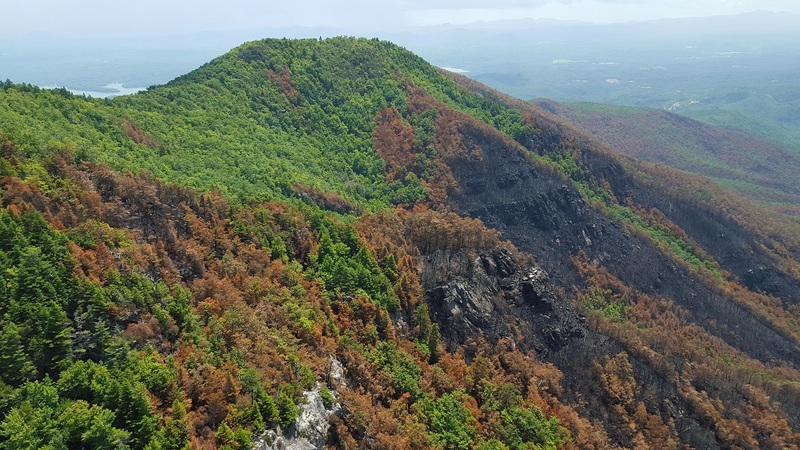 Here's the detail: The Bald Knob area of the trail has been closed between the Catawba River and Forest Road 106 near Linville Gorge since Mid July. The photo up top is from the current incident report. In the map immediately above, the MST is the fine dotted line that runs right through the red-hatched area. Looks nasty. 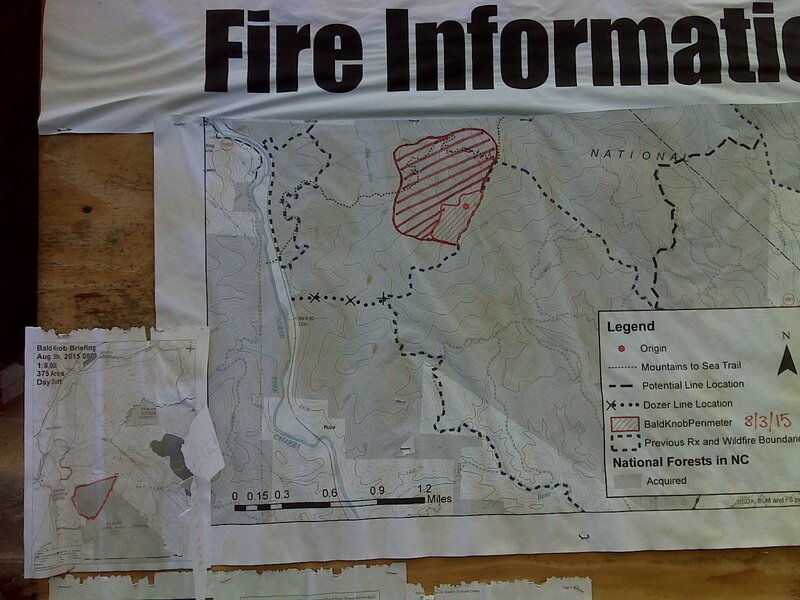 Current estimate is that the fire won't be controlled for another three weeks--September 10th. So my options were to do an alternate route or jump ahead, skipping the closed section and returning to do it another time. It didn't take long to make up my mind. I've been hiking these mountain miles of the MST without any set goal. 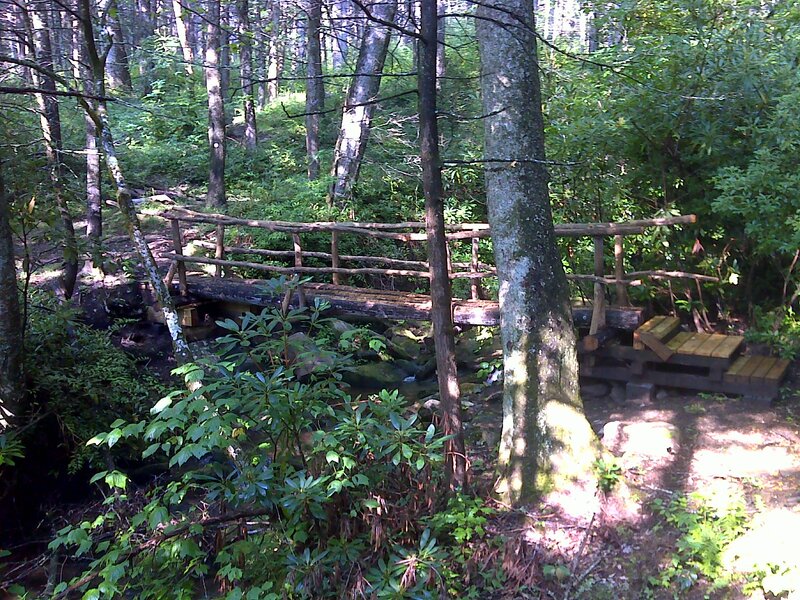 I'm not thru-hiking, and I have no deadline in mind for completing the trail, so I have chosen to move on, do some hiking on the Benton MacKaye Trail and Pinhoti Trail in north Georgia, and come back to the MST another time. 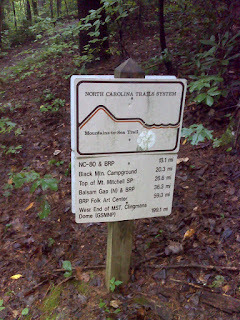 Unlike with this piece of the MST, I have a larger purpose for hiking the North Georgia trails. 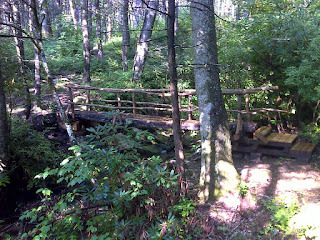 The purpose is to extend my continuous trail of footprints southward from the Appalachian Trail, eventually into Florida. More on that in another post. 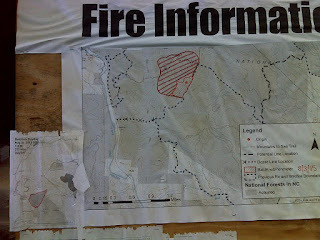 But first, here are a few of the highlights of my MST hike to the brink of the fire. Woods Mountain is a distinctive peak. It juts out into the low elevation country north of Marion, NC and was the site of an important fire tower at one time (rather ironic, come to think of it). Coming east from Buck Creek Gap, the MST follows a long ridge, often surprisingly level despite being narrow and occasionally rocky. It was a lot of fun hiking this ridge. It would have been much more fun if I had been able to see more than a mile! This ridge, and Woods Mountain in particular, seem to be made of some especially hard rock. The rock springs from the ground in unusual ways. 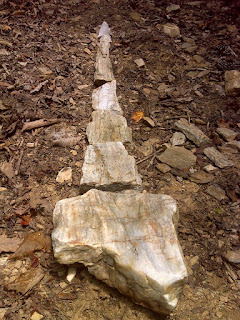 And in other places it shows distinctive dark striations in white quartz. This is the most distinctive rock I've seen anywhere on the MST, so I picked up a pebble and am keeping it as my MST souvenir. Below are larger samples that I assembled and lined up as a whimsical trail marker. 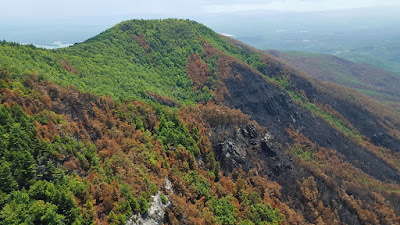 On the east side of Woods Mountain, the MST plunges down 2000 feet in a couple miles, crosses Tom's Creek, and then meanders out to the crossing of busy US 221 at the National Forest Service's Woodlawn Work Center. Here I found the only truly comprehensive MST signpost that I've seen along the entire trail. On the West side of Buck Creek Gap, there is a brand new two mile section of MST between Black Mountain Campground and FR 2074. This was formerly a road walk of about a mile in length. 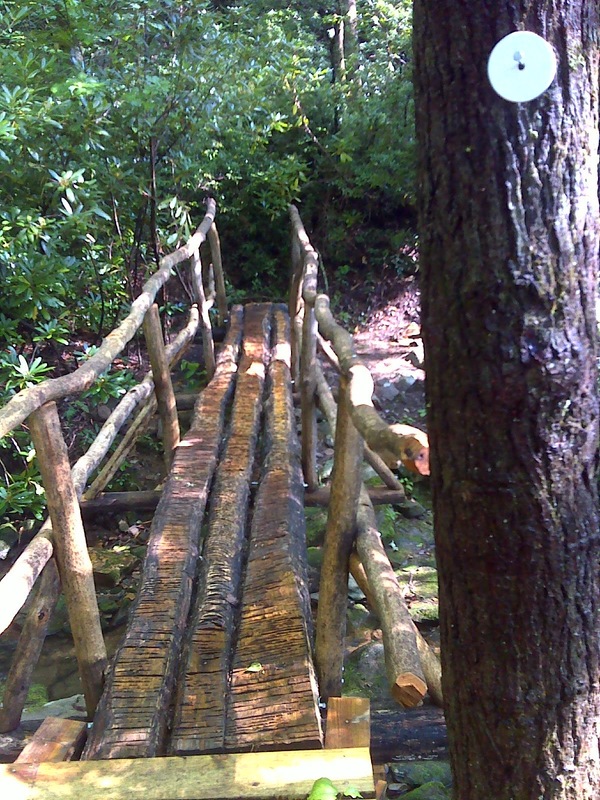 The new trail, which appears to have been open only a few months, is about two miles in length and features a beautifully constructed brand new rustic bridge, made mostly of locust logs. The woods are pretty here. Even the plants that live here seem to be expressing their love of the place. I've had a great time trekking 150 more miles of the MST this summer. I estimate that I have another 140 miles or so to do - in three separate pieces including the 60 miles through the burn area between Woodlawn Work Center and Beacon Heights. 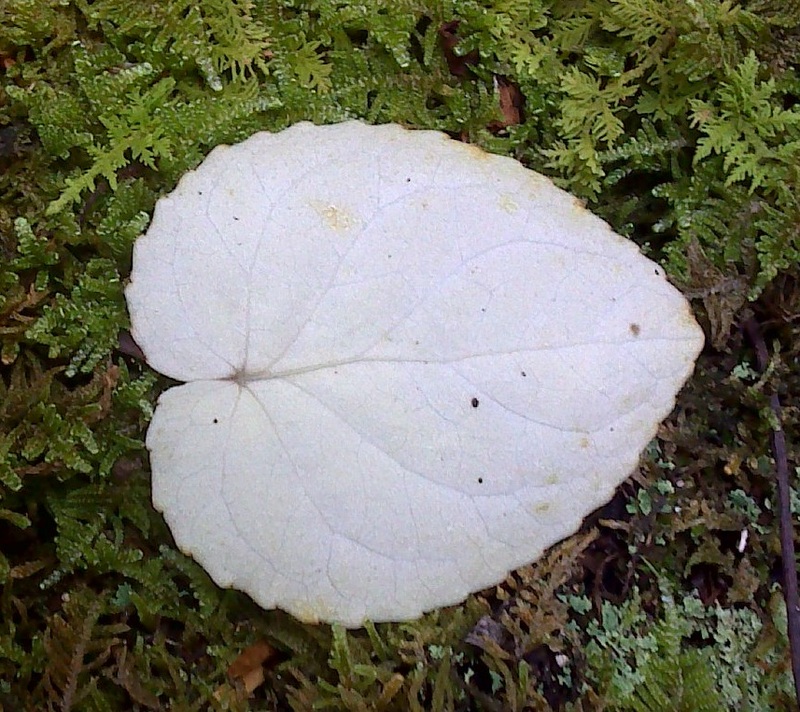 Long distance hikers often find that when they're coming to the end of their trek a certain melancholy sets in. They don't want it to end. Maybe that's why I'm saving those last miles for later.